Summer’s just around the corner so it’s time to get yourself a pedicure, take a pumice stone to your feet and put on your sandals. I thought I’d put together a quick blog featuring my favourite sandals on the high street at the moment and give you a bit of a steer as to what’s hot this summer! First of all, New Look, the first place I go to when I need some new shoes. They have the biggest range of shoes and offer great prices. One trend I’m seeing everywhere and especially on other blogs are caged sandals. This pair from New Look are a lot less harsh looking than the black ones and the dusty pink is extremely pretty. These can be dressed down with jeans or dressed up with a dress or tailored shorts. I also like the mid-heel on these; they’ll be comfortable enough to wear in the day and you’ll be dancing all night if you wear them out in the evening. If you like those sandals but would prefer flat ones, New Look also cater for you. These white caged sandals, will go with any outfit and will look great with a pair of frilly socks! Who said socks and sandals don’t go together! I am loving these sandals! 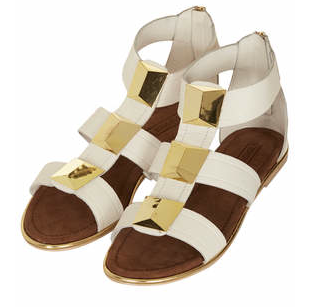 These gladiator style shoes would look great with some tailored shorts, plain tee. and gold jewellery. With the gold pyramids, these sandals need to be the stand out item of any outfit. I’m not the biggest fan of the Poolside Sandals trend, but these from Warehouse, caught my eye and look nicer than any others I’ve seen in the stores. These leather sandals are great to wear in the day, shopping, in the garden. They look incredibly comfortable and a lot better than flip flops. 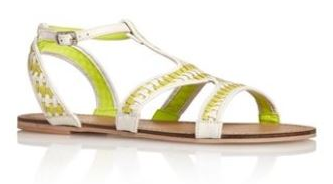 There are a lot of pastel colours on the high street at the moment, so this pair of lime weave sandals look really fresh and summery. Again, the gladiator style makes an appearance (will this trend ever go away!) Saying that, I do think this style is very flattering and support the feet more than a conventional flip flop. Not only do these sandals come in juicy lime, but they also come in a coral pink. 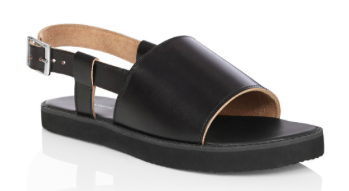 You can’t talk about sandals without including a wedge shoe. Just like the weave sandal, the stone/cream wedge with the lime green foot strap really make a statement, looking extremely clean and fresh. 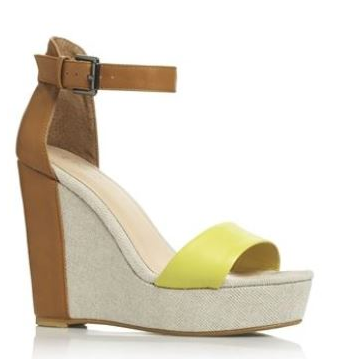 These wedges would look great with a shift dress and bright jewellery for a night out with friends or family. I also like how the brown compliments the other colours – you’d never think these colours would go together. Definitely a must buy!